A Dendran proverb: Stay on the wood, as it should. Step off the tree, end of thee. Ark is a Dendran plumber’s boy who overhears a sinister plot to destroy his home; all while standing deep in golden squit. (You definitely know what this is. Think of a similar sounding word for foul smelling gold nuggets) He and his bestest ever buddy, Mucum, race from the highest treetops of Arborium to the deepest roots of Ravenwood – a place where light can hide a hunter from prey – to find a way to save his people. In a race against time, Ark runs for his life and fights to stop Maw – the monstrous super-power with weapons of glass and metal, which pollute the earth with their factories and tall structures – from taking over the last and the largest trees on earth. The world in which the author builds this story from is amazinfghhghghghg. People living in gargantuan trees because of evolutionary need? Seriously talented thinking. The author shows, not tells, the ignorance and greed of the human race while attempting taking care of the planet. I wanted to write an entertaining book full of action and humour (like those squitty jokes) but with an ecological theme at its heart. I wanted to talk about the current environment of which we’re living in and speak out for it to the next generation whom will have to pick up the pieces of what we have left behind. Fantasy/ Sci-Fi books are in trend now. Look at Twilight, The Vampire Diaries, The Hunger Games, Divergent, Percy Jackson, The Mortal Instruments and the list goes on and on. 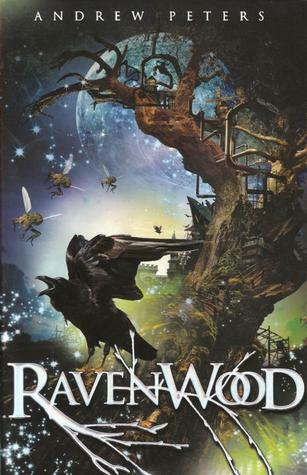 Ravenwood isn’t similar to those books – I’m not saying that it is especially good or that the other fantasy/ sci-fi stories aren’t good or anything. In fact, I’m a big fan of the Hunger Games as well! It’s simply that Ravenwood does not have hostile invasive otherworldly beings; just hostile invasive humans. It doesn’t emphasize on romance as much but instead on friendship, which still leads to an astounding book. It takes real life as its basis, and instead of distorting it into a Dystopian world of people fighting to stay alive, it weaves a world where teenage kids have to fight to save their precious leafy home by literally going to the root of it. Ravenwood plunges readers into a magical world of massive trees, with ravens as dark as night having claws as sharp as scimitars. With an enemy hovering over the whole of Arborium, Ark – through his journey to save Arborium – finds out that he might not be exactly who he think he is. It has a few quirky scenes here and there with a hundred ways of using squit in a sentence, Ark’s terrible punch lines and the use of a modern cusses like: ‘son-of-a-beech’. Overall, I guess Ravenwood’s good squit, but the only way to find out is to read it yourself.